You'd think he'd have a wooden paddle for a leg instead of a peg. FLOOT. So its more asomer than pie and pi?!?! santa clause is dead to me. on a related note, god is dead to santa clause. hmm that gives me an idea. I got to think up imaginary figures like Santa or the Easter Bunny for Naucean culture. Thanks operaghost21 AND Alwayswatching! hmm that gives me an idea. I got to think up imaginary figures like Santa or the Easter Bunny for Naucean culture. Thanks operaghost21! I was thinking the same thing! Will be intersting to see how Naucean imaginary holday creatures looks like. Hey! I mentioned Santa Clause first! Qat is a diffrent type of God. One in which is based upon a real Mountain Tribe Naucean who use to bring eggs to the villages up in the mountains on a Woolly Gobblehorn pulled sled. 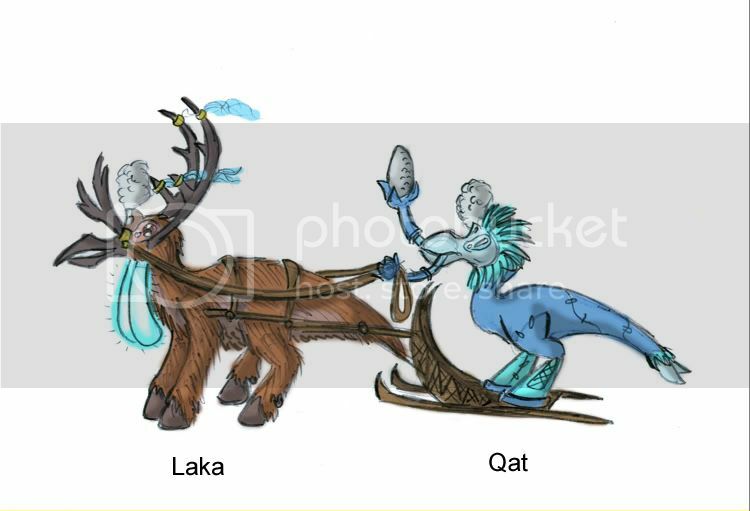 But over time it transformed into a mythical god named Qat, just like the Gas giant in their solar system and his woolly gobblehorn called Laka, also like the Gas giant in their solar system. Qat wears a bright blue leather suit and leave a silver woolly gobble horn egg in juvenile Naucean's "floots" which hang on the fireplaces to dry out from walking in the snow. He comes in at night on the very fast slead pulled by Laka the magical woolly gobblehorn which has glowing gobbles to see though the fog. Unlike Earth's Santa it cannot fly but he dose sled around at super fast speeds. Over time this strange tradition of the winter solstice spread to other tribes and changed as it went. For the river tribe he rides around on a lystrophant, while for the desert tribe he rides around on a desert gobblehorn. But they all have the gobbles or trunks glowing blue. It is not clear how he is related to the other patheon so it is widely accepted as a children's imaginary tradition. Durring the modern age marketing of Qat exploded with tons of merchandise such as silver egg shaped trinkets and even woolly gobblehorn, egg and Qat shaped ornaments placed on their solstice trees. Now there are Naucean Cowboys, robots and pirates... any chance of Naucean Ninjas at some point?